Principal Investigator Rainer Volkamer, PhD (left), CU Boulder Chemistry Professor & CIRES Fellow, receives an update on the innovative solar tracking device protruding from the roof of the customized NCAR research trailer from researchers Natalie Kille (on ladder) with Roman Sinreich, PhD (standing right). The Volkamer Research Group has developed the first mobile solar tracking instrument to analyze the regional makeup of chemicals in the rarely studied air extending from the Earth to the Sun. “I found the sun!” said research assistant Natalie Kille, age 25, who carefully watched the orange globe representing the sun settle inside a black circle on the laptop computer perched on her lap inside a research van. “We can go now,” she announced to fellow atmospheric scientists Roman Sinreich, PhD, and Philip Handley. The van slowly moved forward pulling a specially-equipped research trailer containing a host of scientific equipment. 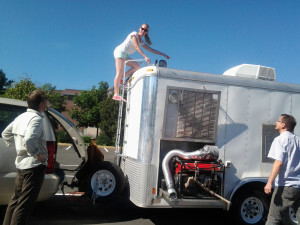 Among the instruments is the first solar tracking equipment in the U.S. that can help analyze a vertical column of air emissions in a mobile vehicle. The CU Boulder/CIRES team is part of the Volkamer Research Group in the Atmospheric Trace Molecule Spectroscopy Laboratory (ATMOSspeclab), and has developed an innovative technology to track regional air quality emissions which adds an important piece to the Front Range Air Pollution and Photochemistry Experiment aka FRAPPE. Volkamer’s group is the first in the nation to build solar tracking equipment adapted for a mobile platform, and to track emissions in a vertical column from the ground all the way up to the sun. The team’s pioneering approach will give the scientific community access to the complexity of air aloft that can be quantified and presented in boxed areas on maps for an entire area or region. (Dr. Volkamer describes the MobileSoft instrument and the team’s research in the above 4-minute video interview). The Air Pollution and Photochemistry Experiment project is funded by the Colorado Department for Public Health and the Environment (CDPHE), along with a seed grant from the CIRES Energy and Environment Initiative. Volkamer Research Group members include Jim Hannigan of NCAR, Owen Cooper of NOAA, and CU Chemistry/CIRES graduate students SunilBaidar and Ivan Ortega, and NASA scientists. The team developed the innovative solar tracking software and equipment which contains motion sensors that adapt to the pitch and roll of a moving vehicle. Keeping the solar tracking system aligned with the sun while the trailer is moving and hitting bumps in the road is among the team’s greatest challenge. Last week, the researchers successfully refined the equipment to account for driving upon Colorado’s uneven road conditions. When Kille proclaimed she “found the sun” she meant the mirrors on the research trailer were properly aligned to track the sun’s position. The solar tracking system is housed in a customized trailer lent by NCAR (see photo). The innovative equipment protrudes from the top of the research trailer where two mirrors are mounted on a rack to track the sun along with input from GPS and wind sensor devices. Additional instruments in the trailer include a mobile Solar Occultation Flux Fourier Transform Infrared Spectrometer (FTIR), a direct sun Differential Optical Absorption Spectroscopy (DS-DOAS) and a Multi-Axis DOAS (MAX-DOAS). The FTIR tracks a large number of chemicals as they absorb the sun’s light to determine the makeup in a vertical column of air. The DS-DOAS measures along the direct solarbeam, and the MAX-DOAS measures scattered sunlight through a rotating telescope. The three pieces of equipment ensure a wide variety of chemical components found in the air are quantified under clear and partially cloudy skies. Which chemicals are the team tracking? Ethane, ammonia, carbon monoxide, nitrogen dioxide and formaldehyde are the current FRAPPE priorities. Each emission has a unique chemical makeup that enables the research team to identify the source of the emission, whether from a natural or a human-produced activity. Volkamer’s group has a vital role to play as their research fills a gap in the study of air quality emissions at a time where there is great interest in anthropogenic methane and ozone-producing volatile organic compounds. Boulder County, Weld County, and Larimer County along the Northern Front Range all exceed the Federal ozone standard of 75 parts per billion (ppb) that is considered “safe” for human exposure. 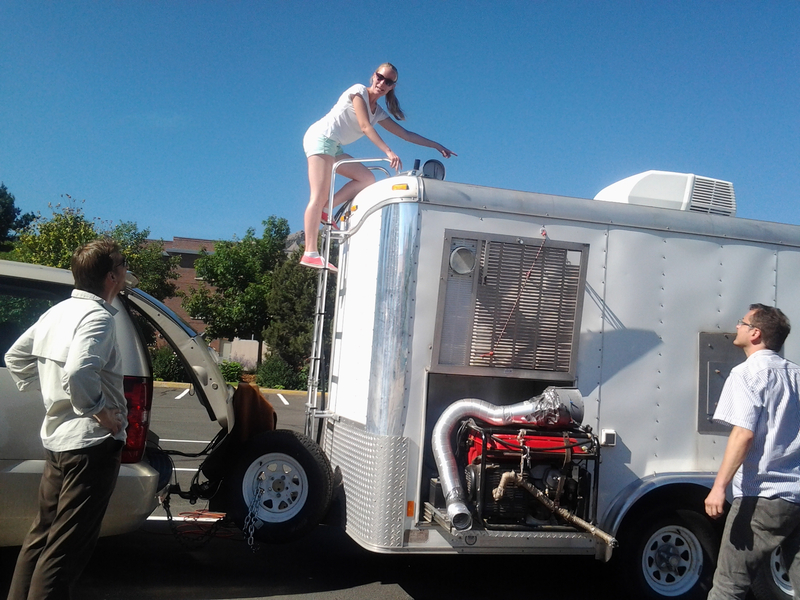 The researchers have been driving the research trailer in the field collecting air quality samples along the northern Front Range since July 2014. While the research being gathered will take months to fully interpret, the equipment has already produced its first set of data. The team will spend the next year analyzing the data. Neshama Abraham is based in Boulder, Colorado, where she writes about atmospheric science research and discoveries that affect the climate and Earth. Educational development Incode Corporation make it right.